Adenopodia spicata (E.Mey.) C. Presl. It's spiny all over, and the whip-like young stems lean out into the path and make themselves felt by the unwary. 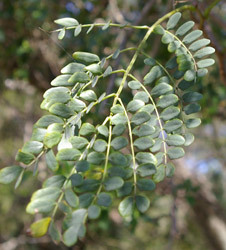 Meet the spiny splinter bean, a characteristic scrambling shrub/tree of the coastal forests of KwaZulu-Natal. Evergreen shrub or scrambler to 10 m tall (rarely up to 30 m). Twigs hairy, slender, brown or grey, 5-angled, with prickles on the angles. Leaves alternate, bipinnate; petioles 35 - 90 mm long, prickly, with a conspicuous gland at the base. Rhachis (leaf axis) flattened or round, often prickly. Leaflet blade 7.5 - 20( - 24) mm long, 2.5 - 7( - 9) mm wide, oblong, rarely obovate; apex obtuse; base obliquely obtuse; surface sparsely to densely hairy; veins densely hairy on lower leaf surface; margin entire. Inflorescence an axillary or terminal, erect panicle of spikes 15- 75mm long, borne in the southern hemisphere summer (November to January). Calyx tubular, lobes (1 -5) yellow to white. Corolla of 5 free petals, to 2.75 mm long, creamy, without markings. Plants with bisexual flowers. Stamens 10 ; filaments free, to 6 mm long, ovary superior, 1locular ; style 1. Fruit a glabrous pod breaking into segments, (50 - 160) mm long, (13 - 37) mm wide (borne from January to August) ; rind smooth, leathery, brown. Seeds dark brown, 7 - 10 mm long, 5 - 7 mm wide. Because it is so widespread and quite common where it occurs, it comes as no surprise that the spiny splinter bean is listed in the current South African Red List of South African plants Data Book (Raimondo et al. 2009) as being of Least Concern. It is not particularly threatened, and is not specifically protected. 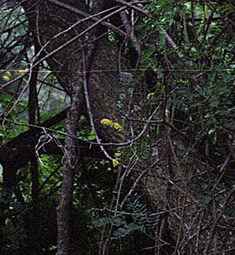 This scrambler is a characteristic feature of forest, forest margins and bush clumps from the Eastern Cape to Limpopo. 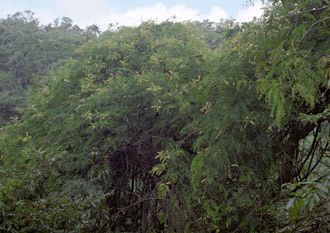 Boon (2010) cites a maximum altitude of 1340 m, suggesting that this plant is frost-tender. It is known from Swaziland but not from Mozambique. Holidaymakers in Durban can find typical populations of spiny splinter bean alongside paths in Pigeon Valley and Burman Bush Nature Reserves, among many other places. Both of these are no more than a few kilometres from the city centre and its facilities. In Mozambique our species is replaced by the much less well-known Adenopodia schlechteri (Harms) Brenan, and in West Africa and the Congo Basin by the even more aggressively spiny A. scelerata (A.Chev.) Brenan. The earliest collected specimens of this species were made by the prolific early-19th century collector, J.F. Drège, at the Bashee River (now Eastern Cape) and Port Natal (now Durban). 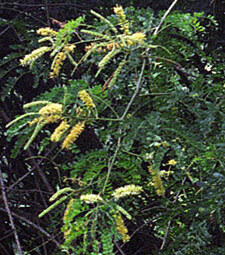 They were described by E. Meyer (1836) as a species of Mimosa, but later moved to the genus Entada, and so this species will be found in some older books as Entada natalensis or E. spicata. Brenan (1986) resurrected the genus Adenopodia for some 10 African and South American species which do not resemble other members of Entada very closely. However, other opinion suggests that three South American species may be better placed in the genus Piptadenia (see Luckow in Lewis et al. 2005). The generic name is derived from two Greek words, aden meaning a gland, and pous meaning a foot, referring to the conspicuous gland at the base of the petiole. The specific epithet spicata points to the arrangement of the flowers in spikes (Glen 2004). Botha & Botha (2006) note that the spiny splinter bean is the host of the larvae of five species of butterflies and two of moths. One may deduce from the white scented flowers that it is probably moth-pollinated. 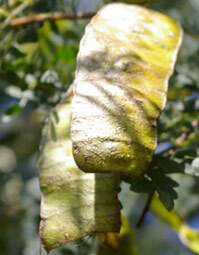 The fruits break up into aerodynamic fragments, each containing one seed, evidence that the seeds are wind-dispersed. Few herbivores would eat or even approach such a spiny plant. Boon (2010) mentions that the roots are used in traditional medicine to treat chest pains and syphilis. Watt & Breyer-Brandwijk (1962) add that the Zulu use a root infusion as an emetic and to fatten goats, and that Zulu sangomas use the crushed roots to increase their powers. Neither SANBI nor individual staff members can take any responsibility for any consequences, should anyone try any of these activities. Probably the most important feature of this plant in considering its garden usefulness is the fact that it is very spiny all over. This means that it makes a good barrier plant, and so will be confined to the boundaries of a suburban garden. It may also have a role in attracting butterflies and moths to a warm, coastal garden, if that is the owner's intention. However, as it is so very spiny it is seriously unsuitable for planting anywhere where small children may encounter it. Its natural range suggests that it is frost-sensitive and requires fairly abundant water, and so will not do well in colder, drier areas such as the Highveld or the Karoo. Carr (1994) reports that all his plants died of cold in Sandton, one of the warmest (but still not frost-free) parts of the Johannesburg area. Nevertheless, related trees of similar habitats (one thinks particularly of the fever tree, Acacia xanthophloea) do remarkably well in Pretoria, so this may be worth a try in the right circumstances there, too. I do not recall seeing spiny splinter bean in nurseries, but as it is quite common outside of nature reserves, it is at least theoretically possible to collect seed in the wild legally, provided that you get the landowner's permission first. Fruits are ripe and harvestable most of the year, with the exception of the (southern) spring from September to December, according to Boon. Be aware that you will almost certainly lose some blood while collecting your seed, however. Carr reports relatively poor germination in standard mixtures, with about one seed in three producing a seedling. One should expect that, just as with many of its relatives, this species will produce a long taproot which will not tolerate injury or excessive disturbance. One may expect that in its natural range this species will be eaten by the caterpillars of the five butterfly and two moth species it is known to host. Provided the numbers of caterpillars are reasonable, and they do not completely strip the plant of leaves, these are to be welcomed rather than controlled. If, however, numbers get out of hand, there are several organic deterrents that one can make up at home, usually based on mixtures of garlic, chillies and other herbs. Gardening magazines print recipes for these regularly. Plants in the wild almost always look healthy, and give no evidence of fungal pathogens or excessive predation. Boon, R. 2010. Pooley's trees of eastern South Africa: a complete guide. Fauna and Flora Publications Trust, Durban. ISBN 9780620460194. Botha, C. & Botha, J. 2006. Bring butterflies back to your garden. Botanical Society of South Africa, Durban. ISBN 9780620366656. Brenan, J.P.M. 1986. The genus Adenopodia (Leguminosae). Kew Bulletin 41: 73 - 90. Carr, J.D. 1994. The propagation and cultivation of indigenous trees and shrubs on the Highveld. Sandton Nature Conservation Society, Johannesburg. ISBN 0620184620. Glen, H.F. 2004. SAPPI What's in a name? Jacana, Johannesburg. ISBN 1770090401. Lewis, G.P., Schrire, B. Mackinder, B. & Lock, M. (editors) 2005. Legumes of the world. Royal Botanic Gardens, Kew. ISBN 1900347806. Meyer, E. 1835-1837. Commentariorum de plantis Africae Australioris quas per octo annos collegit observationibusque manuscriptis ill u i stravit Joannes Franciscus Drège. L. Voss, Leipzig. Raimondo, D., Von Staden, L. Foden, W., Victor, J.E., Helme, N.A., Turner, R.C., Kamundi, D.A. & Manyama, P.A. (editors) 2009. Red List of South African plants 2009. Strelitzia 25. South African National Biodiversity Institute, Pretoria. Van Wyk, A.E., Van der Berg, E., Coates Palgrave, M. & Jordaan, M. 2010. Dictionary of names for southern African trees. Briza Academic, Pretoria. ISBN 9781920146016. Watt, J.M. & Breyer-Brandwijk, M.G. 1962. Medicinal and poisonous plants of southern and eastern Africa. Livingstone, Edinburgh.